For a while it was thought that the baby boomer generation would not be relocating after retirement. The Great Recession had people thinking that baby boomers would simply remodel and stay put for their golden years. However, second only to millennials, who make up 35 percent of home buyers, baby boomers represent 31 percent. With the upturn in the economy, baby boomers have indeed been relocating and downsizing plays a large role in these transitions. When baby boomers retire, their adult children are often tasked with finding ways to help them part with belongings accumulated over decades. 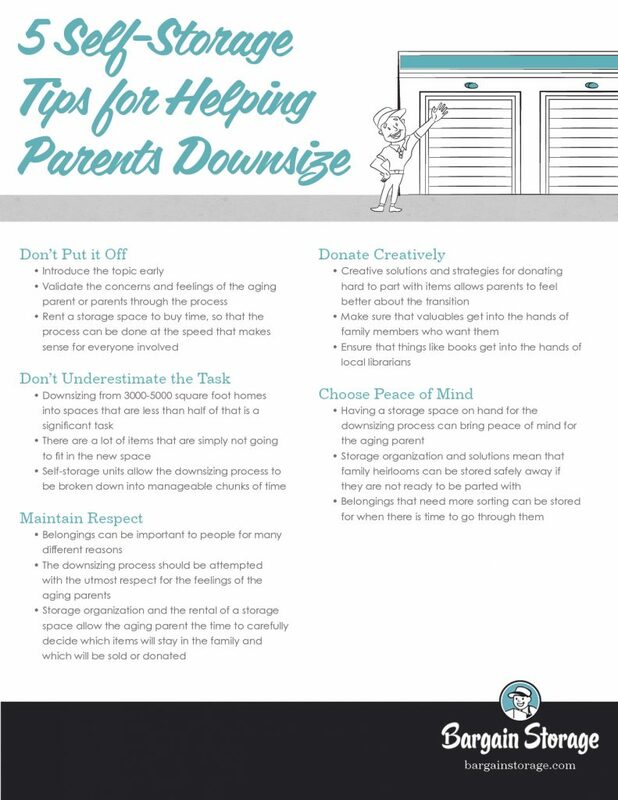 These downsizing activities can be very challenging for both the parents who are retiring and for those who are helping them do so. Some of these adult children are in the group termed “The Sandwich Generation.” These are the children of aging parents who also still have their own children to support. This generation of people is usually in their 30s or 40s when they are called upon to assist their parents with the transition to retirement. 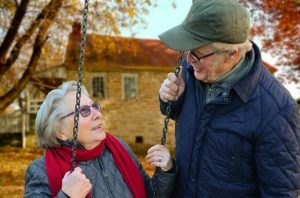 In many cases, the member of the sandwich generation is even caring for the aging adult at the same time that they are caring for their own children. This can be extremely challenging. Don’t Put it Off: Without a doubt, downsizing a parent’s home can be a monumental task. However, the discussion will be more difficult should a financial or health crisis occur. It is better to introduce the idea early and involve other siblings in respectful discussions with parents. The concerns and feelings of the parent or parents should be validated through the process, and this is most easily accomplished when there is not a time crunch. This is one of the many benefits of a storage space in this situation. It buys time, so that the process can be done at the speed that makes it comfortable for everyone involved. Don’t Underestimate the Task: Baby boomers will often downsize from 3000-5000 square foot homes into spaces that are less than half of that. They are either following the trends of moving to condos, rentals, or retirement units, or they are opting to live with their adult children in multi-generational housing situations, such as in homes that include an additional full suite inside the house or that have a small apartment on the property. There are a lot of items that are simply not going to fit in the new space. Self-storage units can be a lifesaver in that they allow the monumental task to be broken down into manageable chunks of time. Respect Wishes: Because belongings can be important to people for many different reasons, it’s vital that the downsizing process is one that is based on mutual respect. This can be difficult when the adult children are pressed for time because of legitimate situations in their own lives. And, of course, no one wants to create problems in their families. So, going into this task with patience and a determination to be respectful can help tremendously. So can storage organization and the rental of a storage space. These allow the aging parent the time to carefully decide which items will stay in the family and which will be sold or donated. Donate Creatively: There are going to be a lot of things that do not need to be kept for any reason. Regardless, they can be hard to let go. A way to ease this is to offer creative solutions and strategies for donating these items to those who may value it as much as the parent does. Making sure that items are fitted to family members who want them and things like books are donated to local librarians can make the difference for a parent who is having trouble letting go. Here too, self-storage units can be of assistance as items to be donated can be sorted over time. Choose Peace of Mind: Having a storage space on hand for the downsizing process can bring peace of mind. Belongings that need more sorting can be stored for when there is time to go through them. This takes the pressure off parents, but still allows the adult children to complete the task and move the parent into their new space in a timely manner. Helping your parents downsize is a big responsibility and our experienced managers and friendly teams are here to make sure the process is as seamless as possible. We understand you have options and that’s why we pride ourselves on making a personal connection with every customer. We invite you to contact us today to learn more about our storage options, quality spaces and low, straightforward pricing. We’re happy to give you (and your parents!) a personalized tour of our facility. Our Arizona locations surround the Phoenix metropolitan area, including Glendale, Peoria, Mesa and many more. We also have three locations in Tucson. From Fort Worth to Spring, Texas, Bargain Storage has multiple locations in The Lone Star State in the Houston and Dallas metropolitan areas.